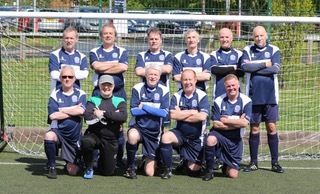 A mixed team of Over 60 and Over 65’s returned to Worcester on Wednesday 2nd May to compete in the University of Worcester Walking Football Tournament. Birmingham were runners up in this competition last year when it was played in sweltering conditions and they returned this year determined to win it this time round. This year the weather was the complete opposite and the matches played in a mixture of sunny, rainy and monsoon conditions which even included a hail storm!! The first match was against newcomers to this competition in the form of a team called Freedom, a bunch of old boys from a local leisure centre who have got together and formed a team and went out to give it their all. Just what Walking Football should be about! Last up in the group stage was the team from the University of Worcester. Last year in tropical conditions Birmingham ran out 8 – 0 winners, but this year the score line was not so flattering. Birmingham were into the final where they were to meet a very physical and aggressive Evesham side who’s tactics seemed to be to shut out Birmingham’s forward threat by fair means or foul. The first half was all one way traffic with Birmingham dominating the midfield area once again and they were unlucky not to be at least a goal up at half time. The match continued in the same vein in the second half when the referee finally decided to speak to Evesham regarding their overzealous tackling and running. Birmingham stepped up the pace even more at this point and a superb long range effort from Frank Hughes found its way into the corner of the Evesham net to win the game and competition.